I was talking to her a few days ago, telling her that we need to go for a ride. We've been working our butts off around here, after fall and winter of rain, rain, rain, drizzle and gloom. These sunny days have us outside working! I need to go ride. 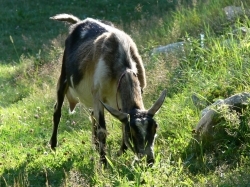 Pioneer Chicken, promiseacres and B&B Happy goats like this. Congrats! What a pretty horse Pearl is! Pearl is shedding and her color is lighter. B&B Happy goats, Pioneer Chicken and Rammy like this. Bruce and Rammy like this. I'll give her a good brushing and snap her picture. She is a different horse than the one we brought home. Our friend and neighbor, Robert, put a gate in the fence that opens from our horse pasture onto his property. He lets the horses in to graze. He says Pearl won't let him touch her, he can get close, but no touching. She had to been terribly mistreated. She loves me, though. And I love her. Maybe you can show Pearl that Robert is OK. If she trusts you and you trust him, maybe she will figure out he won't hurt her. B&B Happy goats, promiseacres and Rammy like this.